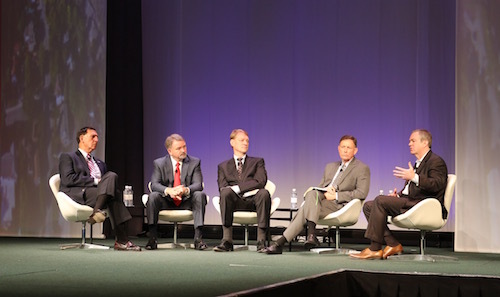 Industry members should communicate regularly with regulators, legislators and government officials as the unmanned systems community continues to grow, speakers at the final general session at Xponential said Thursday. LoBiondo said the Federal Aviation Administration reauthorization faces an unclear future, with competing House and Senate versions and the ever present possibility of one or more extensions, such as happened repeatedly with the previous bill. However, it’s on track to make some good changes for the industry, he said. “We believe that the test sites have been underutilized, so in the bill we are extending the test sites for six years,” he said. NASA’s message to industry is to “stay with us” as the agency helps develop an unmanned traffic management system for unmanned aircraft, said John Cavolowsky, director of NASA’s Airspace Systems Program. That effort now has 200 partners on the effort, which recently held a joint mass demonstration involving multiple UAS flying at all of the test sites, avoiding each other and simulated manned aircraft inserted into the system. Marke “Hoot” Gibson, senior adviser to the unmanned aircraft systems integration office at the FAA, said the industry will now have a platform to engage with the agency on a regular basis, with the creation of the new UAS advisory committee that Administrator Michael Huerta announced at Xponential on Wednesday. Frank Kelley, the relatively new deputy assistant secretary of the Navy for unmanned systems, said attending events such as Xponential is critical for conducting the kind of outreach he needs to do. Xponential host Miles O’Brien, a longtime science and technology reporter, said the media still doesn’t understand the potential of unmanned systems. “Not a single airplane has struck a drone, despite all of the coverage that might lead us to think that the skies are filled with drones,” he said, although, as a pilot himself, he has hit a bird with his plane.